The study of natural areas can improve our understanding of plants and animals that occupy different habitats. Land managers need this kind of information for making decisions about how best to manage, restore, or protect their lands. However, it is not possible to measure each aspect of biodiversity. Studying one or several species to better understand the natural area as a whole is a common, but relatively understudied, practice. In the Pacific Northwest, Partners in Flight – a broad partnership aimed at conserving bird populations – has been using birds as focal species for nearly 20 years. The premise is that a suite of songbird species that are closely tied to key habitat features will represent many other bird species and other elements of biodiversity. Scientists from Klamath Bird Observatory and the Klamath Inventory and Monitoring Network of the National Park Service teamed up to think about how the focal species approach is being applied to six national parks in southern Oregon and northern California. Specifically, we examined whether the Partners in Flight focal species, which are derived from expert opinions and knowledge of birds and their habitats, did a good job at representing three additional management concerns: 1) vegetation, 2) other songbirds, and 3) more specifically, songbirds in decline. We then tested whether we could develop a focal species list from existing park-specific bird surveys that would do a better job at representing the other groups. The results were recently published in the scientific journal Ecological Applications in an article titled Established and Empirically Derived Landbird Focal Species Lists Correlate with Vegetation and Avian Metrics (CLICK HERE TO SEE THE PUBLICATION). 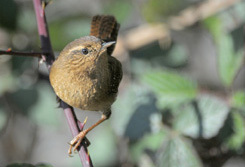 The Pacific Wren is a Partners in Flight focal species for Oregon/Washington western coniferous forests. The focal species list developed from park-specific bird surveys suggest adding them as a focal species in California as well. Photo credit James Livaudais. If focal species do a good job at representing other groups of birds or vegetation, then the list can help land managers make better decisions about natural areas. Deciding which correlations are most important will depend on the management question at hand. For example, with vegetation management, if focal species are highly correlated with other songbirds and vegetation, managers can confidently apply their knowledge about the focal species to planning needs, such as developing a restoration strategy. Partners in Flight focal species represented three other components of biodiversity (all songbirds combined, songbirds in decline, and vegetation) in some, but not all, instances. We found that the Partners in Flight focal species did a good job of representing other songbirds at four of the six national parks. For all parks combined, the focal species developed from park-specific bird surveys improved correlation, showing the most notable improvement at Crater Lake National Park, where the existing focal species did not correlate strongly with the other groups. In contrast to the close association with songbirds generally, the Partners in Flight focal species lists represented songbirds in decline at only two of the parks. It is likely that species in decline have different habitat needs or experience different threats than the focal species. 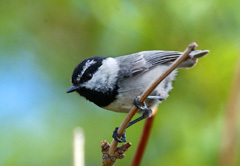 The Mountain Chickadee was selected for the focal species list at Lassen Volcanic National Park when data from park-specific bird surveys were used. Photo credit James Livaudais. Partners in Flight focal species lists are based on breeding season habitat needs, but food and habitat outside of the breeding season are also critically important for birds. For example, understanding how seasonal habitat and food needs relate to songbird health and ability to produce young, and how climate interacts with those, may inform conservation of declining species. Adding focal species that can represent limitations or threats outside of the breeding season may expand the use of this approach in the context of widespread bird population declines. Further, continued long-term monitoring in the parks is critical to understanding both whether local bird populations show similar dynamics as the same species at regional and national scales, and if so, the reasons why.